2 dogs today foiled an attempt by two suicide bombers to carry out a deadly attack at Moloi General Hospital in Maiduguri Borno state. According to an eyewitness, the suicide bombers were prevented from entering the hospital premises due to persistent barking by the two dogs. 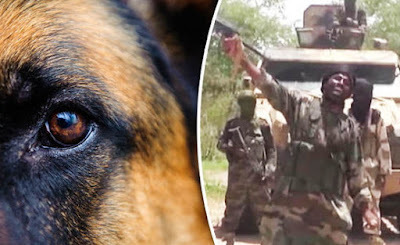 The source said when the bombers (male and female) tried to forced their way into Moloi General Hospital in Maiduguri, the dogs attacked them forcing to detonate their explosives. Only the dogs and the suicide bombers died in the foiled attack. THOSE HEROIC DOGS should have survived and be fed with a whole chicken each as a reward for their bravity and let those vampires die and roast alone. More dogs should be trained on how to detect those terrorists. This is another eye opener for our security operatives. THEN. WE NEED TO ORDER MORE THOUSANDS OF DOGS TO HELP US CLEAR OUT THE DEMONS.